South Africa’s first dedicated walking festival is scheduled to be held along the Garden Route this Easter holiday from 25-30 March 2016. 1With 52 walks over 5 days, ranging from gentle to strenuous, the festival offers walks all along the Garden Route from George and Wilderness, Knysna and Plett to Storms River and Tsitsikamma, it is an event that the whole family can enjoy. The team of Lunchbox Theatre spent an intensive 6 days rehearsing their new show, first time directed by someone who is not part of the team – the wonderful, nationally acclaimed theatre maker Nhlanhla Mkhwanazi. This play is targeted at high school learners and adults, and aims to encourage people to get tested and know their HIV status. Something that can help people to make the right choices to live a long and healthy life. The story centres around 3 brothers who leave their rural homes to work on the mines in Jo’burg. Each embarks on their own journey of discovery as they face the many challenges they confront. The cast of Mncedisi Ncedani, Amanda Valela, Gaillene Isaks, Siyabonga Zabo and Stuart Palmer all gained valuable experience working closely with Nhlanhla over the 6 days. The show will be polished over the next couple of weeks. Keep and eye on local press and our Facebook page for more info.This project is made possible with the generous support of the National Lotteries Commission. Underpinning the Knysna Literary Festival, the Garden Route’s premier literary event, is the ethos that the local community should benefit from the educational and cultural benefits and economic opportunities the festival brings. 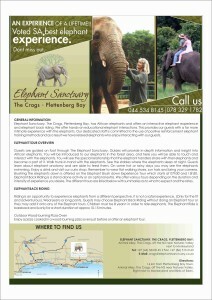 Where possible, support services are sourced from within Knysna and festival venues are selected with the purpose of showcasing the town’s hospitality infrastructure and celebrated natural settings. The festival donates approximately 30% of its revenue from ticket sales to local charities that focus on childhood development and education, a percentage they look to grow in future. Now in its seventh year, the festival aims to promote South Africa’s rich literary heritage thanks to a diverse programme that includes current affairs, politics, history and adventure literature. The festival has grown rapidly in recent years as has its commitment to education. Unique literary experiences offer attendees and the community various opportunities to engage with authors and experts on both popular and scholarly topics, by means of workshops, presentations and informal discussions. In 2015 nearly 1000 learners attended the Children’s Theatre performance while the Young Writers’ Competition – which attracts entries in English, Afrikaans and isiXhosa from rural schools – has increased in support. Important components of the festival’s outreach programme are the FundZa writing workshops and a mentoring programme funded by the National Arts Council (NAC). 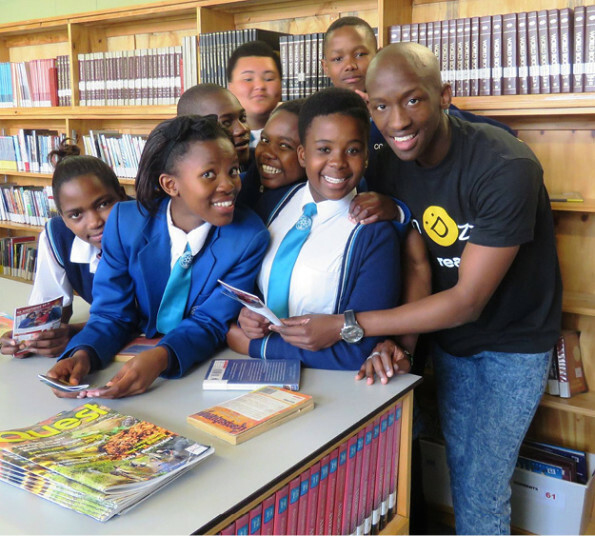 A non-profit organisation, FundZa is dedicated to fostering a culture of reading and writing among underprivileged South African youth, aged 13 between 25, from under-resourced communities. With a mission to build a culture of reading and writing, FundZa develops the country’s future writers by exposing communities to quality content in unconventional mobile media, enabling prospective writers to publish their stories while facilitating dialogue and communication. FundZa’s mobi-network has a reach of more than 350 000 youngsters with participants posting more than 100 comments daily, indicative of a highly engaging platform. As there are very few books that reflect the reality faced by youths in under-resourced communities, FundZa doesn’t use texts that are unappealing to potentially reluctant readers. Instead, they facilitate the creation of locally produced content that is relatable to the audience and stories that reflect the issues and ambitions that many young people face. In the Mentoring Our Future Writers Project, young writers are paired with experienced authors with each pair having to write a set of short stories that are linked to one other in some way. Both parties give feedback to one another on their stories, with young writers gaining support while mentors gain insights from younger and often trendier mentees. According to the 2011 Progress in International Reading Literacy Study (PIRLS), 43 percent of South African Grade 5 learners’ reading skills were lower than that of the international expectation on a Grade 4 level – a finding that ranked the country as the lowest of all participants in the study. Within this context organisations such as FundZa, who approach literacy issues in an innovative manner, are essential to improve national proficiency in reading and writing. This NAC funded collaboration with FundZa is a boon for the Knysna Literary Festival, adding gravitas to its commitment to education and training of the local community, where other similar ventures are more focused on the bottom line and corporate sponsorships. 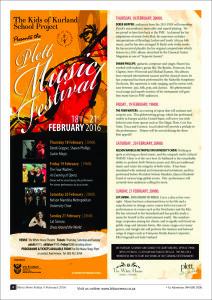 The seventh annual Knysna Literary Festival will take place from Thursday, March 17, to Sunday, March 20, 2016. The Plett MAD Festival and Plett Food Film Festival – the second annual Plett MAD (Music, Art and Drama) Festival held in June and July of this year included the Plett Fringe Festival with artists from all over South Africa performing at The White House, interesting art exhibitions, musical performances all over town and the Plett Food Film Festival – a pairing of compelling food and delicious film hosted by actress Lika Berning and celebrity chefs Reza Mahammad and Karen Dudley. Also in its second year, the Sasfin Plett Wine and Bubbly Festival was a huge success – held right on Central Beach with musical performances from Arno Carstens, Josie Field, Gerald Clarke and local musicians. Plett wine and bubbly were the stars of the show with 9 estates showcasing their delicious MCC bubbly, whites, roses and even some new reds – the Plett Winelands are expanding each year. Fun, fabulous food was provided by some of Plett’s top restaurants and the holiday period was made even more enticing by the inclusion of smaller wine estate events, the Tour de Plett MTB race and the Robberg Xpress Trail Run all over the same period. 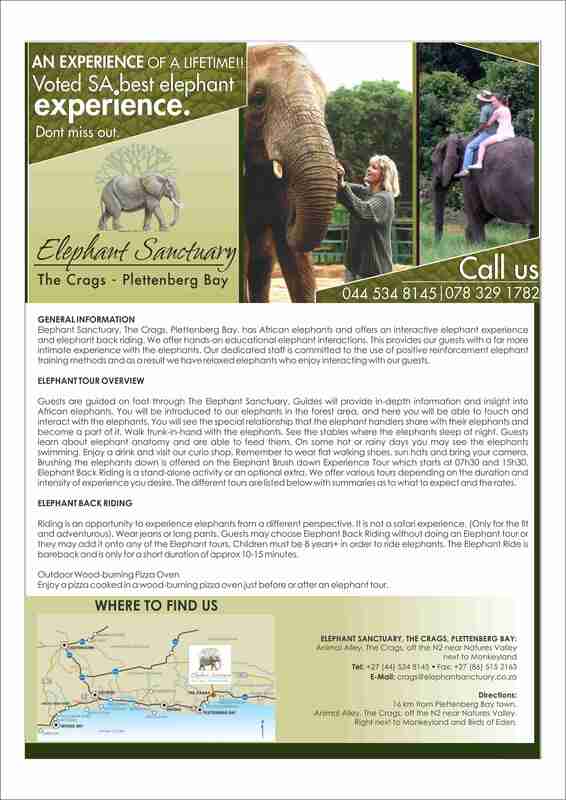 Easter is always a good time to visit Plett – the weather is still very summery and there are usually a slew of nature/sport events to enjoy during the holiday period. Most popular is the Pennypinchers Adventure series which includes a night MTB relay, surf-ski race and a trail run – all in Plett’s amazing natural surroundings. 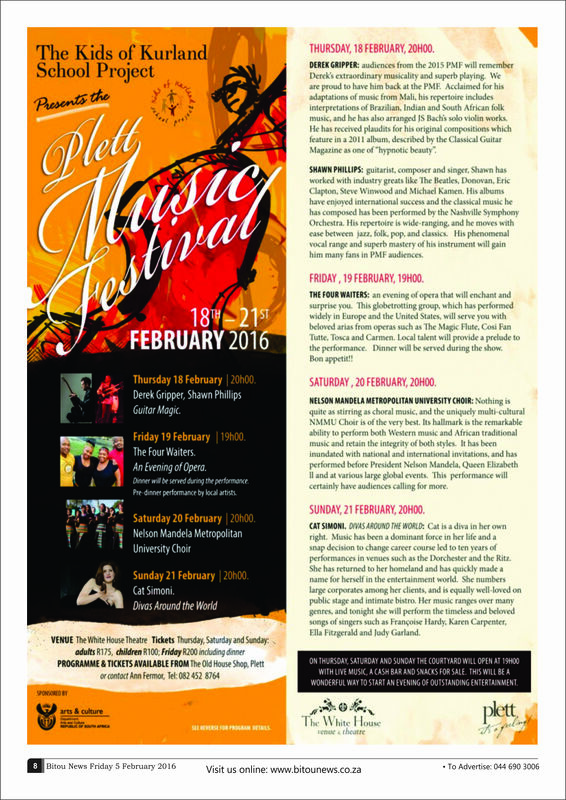 Watch this space for more information on Plett Easter 2016. Colourful Plett Summer is a really wonderful time to visit Plett! Plett is flooded with South African and international visitors, awesome international acts like Good Luck and Castle Lite’s Republic of Extra Cold, Plett polo every day and so much action on the beaches including the Color Run, Sabrina Love Ocean Challenge and ClemenGold’s Hobie Regatta to name but a few. Knysna SPLASH, the annual water festival presented by Knysna Rotary, was a great success and has grown considerably since its inception four years ago, says coordinator Mick Furman, the Rotarian tasked with making it all happen. The Quack Attack duck race on Saturday afternoon was also a hit, with all 1,000 ducks sold out before the race and hundreds of people lining the quays to watch their yellow plastic ducks ‘race’. After four heats, there was a clear winner – first duck home belonged to Steven Naude from Knysna, who won a cash prize of R2,500. Sunday, 20 December featured two new Canoe Races: the Family Fun Canoe Race with a Pirates of the Caribbean theme, and the 10km Canoe Race for more proficient paddlers. “The conditions were not great for paddling, but we had locals and visitors competing in both events,” said Furman. “In total we had nearly 60 boats and over 80 competitors, so we are very pleased with the way it went and are certain that this event will grow next year. Knysna SPLASH is an important fundraiser for Rotary, which donates all proceeds from the entry fees to local charities. Save the dates for next year’s Knysna SPLASH Festival: Saturday 17 and Sunday 18 December 2016. Birds of Eden turning 10! Birds of Eden, Plettenberg Bay, FairTrade Accredited, bird sanctuary, PlettBirds of Eden, the only FairTrade Accredited bird sanctuary in the world is turning 10 on the 15th of December 2015! Birds of Eden was created with the intention of re-homing a number of unwanted birds, giving them the opportunity to live in a more natural environment. We first opened our doors to the public on 15th December 2005 and is the world’s largest free-flight multi-species bird dome/aviary. There are roughly 3500 birds in the sanctuary, comprising of over 200 species. The sanctuary covers an area that is about as big as 3 football fields. With the valleys and touring canopies we had to put up masts ranging in heights from 2 to 34 meters. Over 100km of cable and 8 tonnes of KnitMesh now cover the 3.2 hectare dome. Birds of Eden, Plettenberg Bay, FairTrade Accredited, bird sanctuary, PlettBirds of Eden was built using unskilled labour from the neighbouring community of Kurland Village. The project took four and a half years to complete, without a single IOD (injury on duty) incurred in the building process. Birds of Eden has a river that runs through the entire park in a closed system, which means no pollution of any other water source is possible, giving our animals clean water. An enjoyable part of our river is that you can walk behind our man made waterfall, this makes for excellent photos. We reflect back on the last 10 years as we reach the date on which we will celebrate our 10th birthday! Birds of Eden, Plettenberg Bay, FairTrade Accredited, bird sanctuary, PlettWe will be celebrating 1000’s of birds that are now living free from human interference, free to fly, free to be! We celebrate 10 years of training unskilled labourers and seeing them grow and move on to bigger things. We celebrate 10 years of our own growth as a sanctuary that first housed only birds and now is home to squirrels, blue duikers, giant fruit bats, fish and even a collection of primates. We are delighted to inform everyone that the Mist that was once a much loved aspect of our sanctuary is currently being re-installed and will be up and running on our birthday.